In 2016 those enthusiasts at the Upper Tamar Lake Sailing Club promoted almost a hundred races in a dozen series as well as staging another dozen or so ‘social’ events that were often as strenuous as their sailing. On Saturday 4 December some fifty members of the Club assembled to celebrate a successful year, to present trophies to the many winners of these contests, to eat a fine three course Christmas dinner and to shake a festive leg on the dance floor. The venue was The Weir, the stunning glass-walled restaurant (and wildlife centre) a little way up the river from Bude. The members were perhaps a little unused to seeing each other in heels, dresses, collars and ties rather than in waterproof, breathable coveralls and rubber boots, Sue Murray, Commodore of the Club, looking particularly fine in a puce lace dress. They were soon raising a fine hubbub and attacking their dinners. The presentation of cups followed. Regular readers of the year’s race reports will not be surprised to learn that many awards were made to Jane Anderson, sadly not present this year, nor that the Pollard family – young James and Nathan together with, this year, their father Brian, were also major recipients. The Club has an admirable record for promoting and rewarding junior sailors and there was a big welcome for the winners of the Peter Pocock Cup, joint winners this year: Raily Graham and Arne Hamer. When the trophies were all presented the Club’s tame disc jockey, John Weller, started the dancing music; a rockabilly soundtrack that made clear that the sailing club has been thoroughly infiltrated by members of the Bude Jive Club! The Club’s gratitude to Linda Spiller, Rear Commodore, for organizing this event and all the other social occasions, was expressed as well as thanks to Mandy Pollard, the Club’s secretary and photographer extraordinaire! Many thanks to Mandy Pollard for the pictures. The future of the club…..
A visit to Appledore for an afternoon of archery and climbing was planned for August, postponed to a date in September …….and then finally to 1 October. We were keen, but as each date approached the weather forecast gave us a wild, wet day among bright, calm spells. Third time lucky? No ……..but it was then or never, so we donned waterproofs and braved the elements. Over a rather good lunch at the Seagate Hotel we were teased by a view of sunshine outside, but the Met Office was not to be proved wrong. Happily we were greeted by sympathetic instructors at Skern Lodge and could listen to our safety brief from the shelter of tents. Luckily the strong wind blew in the direction of our arrows, helping them to respectable scores once we’d got the hang of hitting the targets. For some archery was the main draw and there was a chance to continue practise, but for most it was on to the climbing wall. This looked straight forward enough from the ground, but from half way up secure hand and foot holds felt fewer and further between, so we were all very proud of our achievement. It certainly seemed much higher from the top! Sweet success! Well done, Roger…. And made it to the top….. Following on from last year’s success, 13 of us attended this weekend’s visit to Roadford Lake. A few camped, all sailed, all enjoyed it. John D was the first to arrive on the Thursday afternoon to set up camp. Roger followed some hours later, having overcome the trials of a punctured trailer wheel whilst transporting his RS200 to Roadford Lake. John and Roger then spent an interesting hour erecting a canvas lean-to attached to Roger’s campervan. Bob arrived as dusk fell, with his RS200 in tow. Friday morning dawned bright, with early arrivals beginning to sort out boats before the campers had finished breakfast. Geoff arrived, towing his Solo. John D’s and Toby’s Luggers, were launched, together with one of the RS200s, Geoff’s Solo and John B’s Falmouth Bass. A simple sail followed across the lake to the Lakeside café for elevenses then free sailing before returning to the launch ramp for a picnic lunch. After lunch, the wind was just right for a gentle exploration of the various lake inlets, whilst Bob and Roger experimented with their gennaker. The Sailing Centre’s barbeque was coaxed into life for a jolly evening meal, washed down with whatever was to hand, with the campers settling down for another night under canvas, now joined by Geoff. Saturday morning dawned rather dull, but all boats were launched for a return morning visit across the lake to the café. By now, the overcast skies had produced a pronounced drizzle. Undaunted, and suitably attired, refreshments were taken outside, much to the amusement of other café users. The weather cleared, the wind rose a trifle and a pleasant day ensued. Jane C and Nathan were now sailing Roger’s RS200. With plenty of wind available, Roger and Bob succeeded in capsizing the other RS200 as a direct result of some mix-up with gennaker halyards. Having recovered the boats up the launch ramp, 9 of us changed into our shore-going attire and moved on to the Clovelly Arms for a welcome and beautifully cooked evening meal. For the four of us that were camping over the Saturday night, the Sunday morning dawned foggy and still, clearing gently and dramatically as we had breakfast and broke camp. Same again next year? Let’s hope so! On the first Saturday of the school summer holidays, a select group of us found the perfect antidote to the seasonal mayhem developing on our roads. Meeting up at Meeth, we mounted bikes to tackle the six mile journey along the peaceful stretch of the Tarka Trail from here to East Yarde. Firstly meandering through woodland wildlife trust land, we straightened up along an old railway route, bordering forest and open views across farmland, the only disturbance to total peace being birdsong, occasional fellow cyclists, our chat (and the writer’s creaking handlebars!). Gaining 50m in elevation along the last couple of miles called for lower gears and less chat, but we were very well rewarded at the brightly welcoming Yarde Orchard cafe, with generous lunch portions, cake and ice cream. Here we were met by Dawn, James and Nicky, who joined us for the lunch and a chat. The return trip was rather more fun, freewheeling for long downhill stretches through dappled sunshine. There was a brief battle with a wayward chain but we found ourselves back at the car park all too soon. Many thanks to Linda for the photos. Joe Floyd at great speed…. … and John B at almost no speed at all…. Our trip to Lundy Island on the MS Oldenburg was timed for 25 June, to catch a Saturday sailing from Bideford. We were lucky to have a NW wind and swell, reducing the rock and roll of the ship, so we arrived feeling well enough to start our visit with lunch at the tavern. Then there were puffins to spot (some distance below, but visible through a telescope specially mounted for us on the clifftop), as well as deer, impressive cattle, plentiful birdlife, sheep, goats and ponies. Some of us managed a complete island tour, although a good stretch of the not-so-easy coastal path, watching the large number of very fat, contented seals, turned out to be challenging enough for others. The main star though was the spectacular bright emerald and green scenery, in wonderful sunshine. The Tamar Lakeside, on a wonderfully calm, sunny evening was a stunning setting for our summer party on 11 June. The barbecue was busy and there was a wide selection of shared salads and desserts to complete our feast. Acoustic duo, “Idle Hands” travelled from Plymouth to provide us with some great music and their second set prompted us up to dance on an increasingly crowded floor. The evening passed too quickly for the 30-odd people there, but just as hoped, the rain waited until the final partygoers were leaving. Many thanks to Mandy Pollard and Sue Murray for the photos. And the food was pretty impressive, too…. Once again, the club worked with the Lakes Trust to produce a joint event, which combined the Trust’s Open Day with the RYA-backed ‘Push The Boat Out’ promotion. We were so lucky with the weather this time, as in previous years it has been either too windy or so calm that at times the pirate boats could hardly drift off the pontoon. Four boats took part – our two club Bosuns and two Bass Boats – and altogether we took 119 people out onto the water, which was a great achievement. 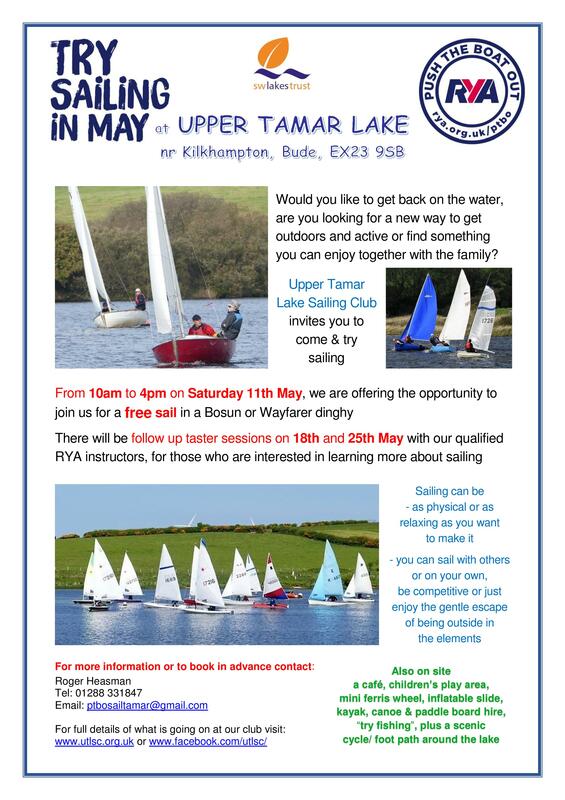 In addition, as a result of the day we gained two new club members and also enrolled two people on the sailing course taking place in June. Heartfelt thanks to all the 32 volunteers who took part (especially those individuals who were either working inside or else on the shore, and who didn’t get out on the water all day); the group photo below shows just some of those who gave up their spare time – and it is a real credit to a smallish sailing club such as ourselves that we can manage to turn out such a substantial proportion of our membership for an event such as this. Thanks also to John Buckett and Roger Heasman, who allowed us to use their Bass Boats and turn them into pirate ships for the day. Many thanks to Mandy Pollard for the photos. As fierce a trio of pirates that you’d ever see this side of the Spanish Main…. Nicky keeping a careful eye out as she returns to the pontoon. “On 7 May eleven of us met bright and early on the quay at Stoke Gabriel. Most of us so bright and early in fact (having over estimated travel time), that the cafe (and more importantly the loos) were sadly not yet open! Fortunately we’d noticed an inviting sign as we’d descended through this pretty village and retracing our way back to the local hall, we found it packed with community spirit, offering not only a very reasonable “cuppa”, but luxury biscuits too. The cake sale was too tempting for one of us, while another came away with a rhubarb plant. Back on the quay we found Andy from Backwater Adventures, our leader for the day. Kitted out and briefed, we set off down river in two person open canoes, just as the skies started to brighten. Helped by the ebbing tide, we made good progress with minimal paddling, so were able to appreciate the tranquil scenery passing by. First stop was a stony “beach” where we were soon happily foraging mussels, winkles, cockles and oysters for lunch. A little further down river, we stopped again for a well earned drink at The Ferry Boat in Dittisham, trying not to take too much Dart mud in to the bar with us! Siblyback Reservoir greeted our slightly apprehensive band of Segway adventurers with a rather demoralising snow flurry, but fortunately the skies soon brightened, along with spirits. Our first group were kitted out with helmets, before gathering for an introduction to this strange machine. The rest of us were there to encourage, laugh and take photos, before cheering them off on their circuit of the lake. Along the way there was a gradual increase in level of difficulty, from a gentle obstacle course practice area, off track into woodland and finally a down hill slalom. We were well supervised, but Segway and rider occasionally parted company, happily with no ill effects apart from a liberal distribution of mud. Despite further bursts of biting sleet, interrupting the bright sunshine, there were wide grins all round. Our second group proved even more adept, surprised at quite how much fun it turned out to be. That perennial UTLSC favourite, the club quiz, returned for another appearance at the Grenville Rooms at Kilkhampton. This year, Linda Spiller had put together a really enjoyable (albeit quite taxing) range of challenges, puzzles and conundrums. There were a huge variety of mental challenges, ranging across a wide spectrum from identifying pictures of mountains to untangling anagrams. Those of a practical bent were catered for as well, with the challenge of building the tallest structure to hold five table-tennis balls off the ground (using only a handful of pipe-cleaners), leading to a wide selection of approaches – most of which reached impressive heights – though few achieved any degree of ruggedness; in many cases, the less able of us were fully occupied retrieving errant Ping-Pong balls as wobbly towers repeatedly toppled to the desk. Midway through the evening, Linda took the opportunity to present Roger Heasman with a framed picture, showing a collage of photos of sailing at the lake (taken by Mandy Pollard), as a token of the club’s appreciation of Roger’s hard work during his three years as Commodore. After totalling up the scores at the end, the eventual winners of the quiz were Jane and Paul Anderson and John and Vicki; congratulations on a fine victory. Many thanks to Linda and Rob for putting what most have been huge amounts of work into a very full evening that generated lots of laughter, as well as the usual furrowed brows – great fun all round. Pick a ball, any ball…. Our first social event of 2016 was something to help us hit one of those perennial New Year resolution targets, keeping fit! With the valued help of Bude Jive Club, a large group of members were able to have a fun taster session to start us on the way to at least beginning to learn to jive. The warm up involved remembering some line dance style moves, easy enough to lull us into a degree of confidence, although there were moments when several of us faced in the wrong direction! Then came our introduction to jive and we were broken in fairly gently with a simple 3 step sequence which had us performing our first turns. After a break to boost energy levels, the pace seemed to “step” up a bit and there were a few more perplexed faces around the room. Still, it was great fun and we now have enough moves to practice at home – Bude Jive Club may have gained a few more members! Many thanks to Annie Quartermain for helping with the organisaton and to Chris Marshall for the photos. Moving so fast that everyone’s a blur….